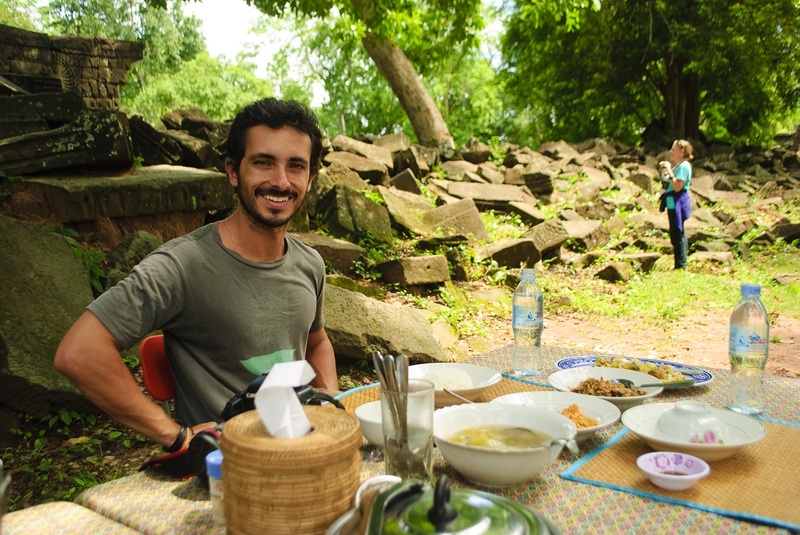 Glamping in Banteay Chhmar in Cambodia: Opulence Amidst the Ruins. Funny how you never think twice about toilets or electricity until threatened with their loss. When traveling to a location as far removed from “civilization” as the Banteay Chhmar temples in Cambodia, these prosaic things suddenly loom large in your imagination. You worry you’ll need to do without. Guests of Khiri Travel’s “glamping” package in Banteay Chhmar need never worry about the absence of such creature comforts. “Glamping” combines two formerly unlikely bedfellows – comfort bordering on indulgence, and access to the great outdoors. Khiri’s Banteay Chhmar package adds the neat twist of putting the lot in the middle of a 12th-century temple complex. Banteay Chhmar is not the easiest place in the world to reach, or stay in. After enduring a three-hour drive through dusty roads, travelers will find no hotels in the vicinity, just homestays offering a bed to sleep in and electricity that shuts off before midnight. Then there’s this package. From our hotel in Siem Reap, we were transported by van straight to a jungle clearing within sight of the Banteay Chhmar temple wall. Two tents were waiting for us at the site, and a look at their contents dismissed any fear that we’d be “roughing it” for the night. The Gore-Tex tents were designed to hermetically seal us off from mosquitoes and moisture (not completely successfully on the latter – more on that later). Furnishings included comfortable wooden beds (not metal fold-ups), a faux-Persian carpet, and a study table with a bottle of French red wine and two glasses. The tent’s bathroom en suite was a pleasant surprise. A separate compartment accessible through its own zip-up door, the bath included a sit-down toilet on a wooden platform and an enamel-floored shower with a rainshower head. Unlike the surrounding villagers, we enjoyed electricity throughout the night, with electric lights, an electric fan, and a few extra power outlets to keep our batteries charged through the trip. 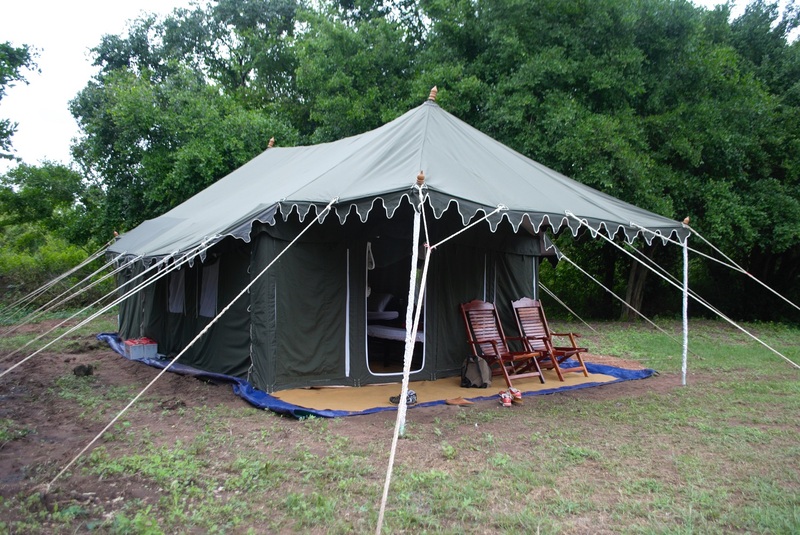 The luxury tent was only the linch-pin in an immersive Banteay Chhmar expedition that lasted most of two days – for the rest of the adventures included in the package, continue to the next page. 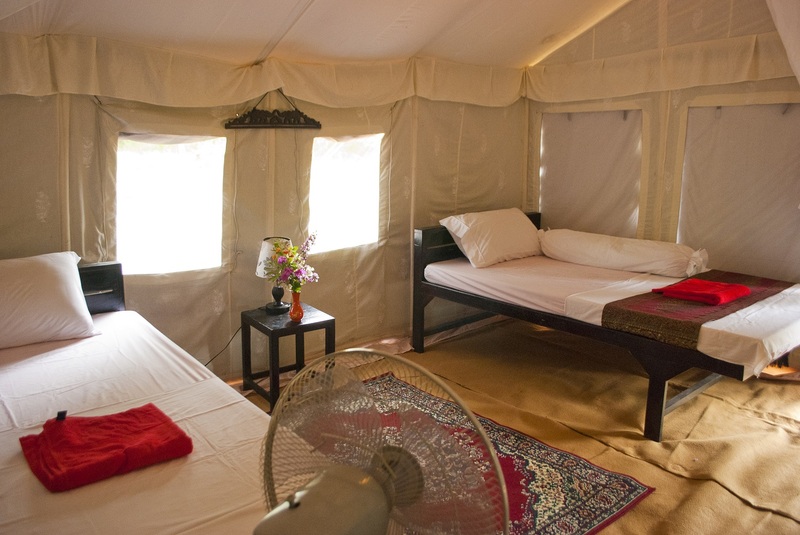 Our luxury tents served as staging points for an action-packed two-day schedule that had us running up and down Banteay Chhmar in Cambodia. We started on the first day with a three-hour tour of the Banteay Chhmar temple and its breathtaking relief galleries, interrupted by a picnic lunch set up right in front of the Avalokitesvara reliefs on the western side. 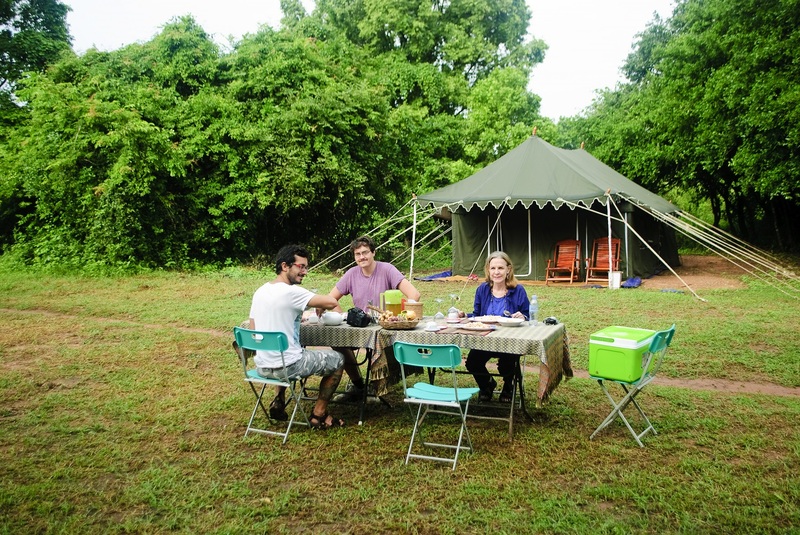 The evening plans – dinner by candlelight at the clearing – were interrupted by heavy rains, so Khiri relocated us to the Community Based Tourism office on the western moat. 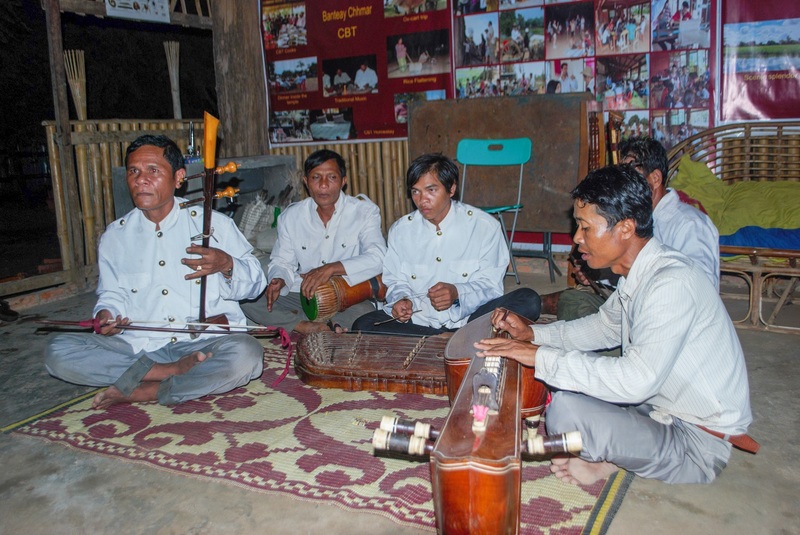 Free-flowing wine, rustic Khmer dishes cooked by the locals, and the haunting sounds of Khmer wedding music performed live by talented villagers – the vibe could not have been more local, or more authentic. On the second day, we packed our things and departed to explore the rest of Banteay Chhmar – three miles north to Pol Pot Baray, an artificial lake built by slave labor during the Khmer Rouge era; then back to town to explore the local market, the Soieries du Mekong silk factory, and the “Ta Prohm” face-tower not five minutes away; then finally to Banteay Torp, a ruin of a military temple located seven miles south and accessible only by a bumpy ride over unpaved roads on a koyun, or tractor. A fellow guest fretted that our luxurious stay experience was far better than how the local villagers were faring for the night. True, but the locals benefited from our presence in other ways. Villagers working for the Banteay Chhmar Community Based Tourism Office (Khiri’s local partner) set up the tents, cooked our meals, and provided the evening’s entertainment. Revenues from the deluxe tent stay go directly to helping the community. Tourist income allowed the CBT Office to set up solar panels in 2010, the first non-interrupted power source in the area, replacing an expensive gasoline-run generator. Training for drivers, tour guides, and CBT support staff – all villagers from Banteay Chhmar – have followed in short order.